Get the ultimate Oregon experience as you explore the incredible waterfalls of Silver Falls State Park and luscious pinot noirs of the Willamette Valley. Learn how these two Oregon treasures are linked by a fiery natural history while taking to the trails and tasting fine wine with your naturalist guide. 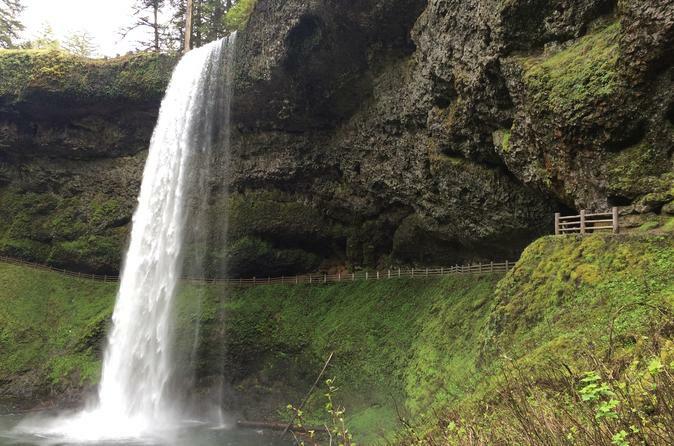 Start your morning in Oregon’s largest state park, Silver Falls. Breathe in the piney scent of an evergreen tree, pick salmonberries in the summer, and get gently misted by one of the Park’s glistening falls. Visit both the North and South Falls, walking with your guide along peaceful nature trails to experience these iconic natural wonders from different angles. Venture along a path that takes you behind the falls, where you can watch the water create a flowing curtain for the cave you’re standing in. Spend your afternoon tasting Pinot Noirs and other fine wines in the intimate settings of three boutique wineries in the Willamette Valley. Take in the rolling hillsides and serene vineyards of the Willamette Valley and learn how the terroir of the land influences the wine in your glass! In between tastings, you’ll enjoy Oregon’s culinary bounty with a fresh, local lunch at the Coelho Winery in the rustic town of Amity.